Posted 4/28/2015 5:29am by OONA COY & BEN JAMES. 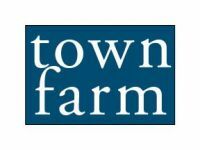 As most of you know, Town Farm is on sabbatical this year, while Oona researches seed-saving and works on food accessibility for Hampshire County farmers markets, and while Ben writes essays and teaches chemistry (yikes) and French (double yikes) to the nine-year-old. We are also, of course, managing Tuesday Market, which starts its season today with a glorious spread of spring food. And while I am well aware that there are in this valley many skilled farmers capable of growing a delicious carrot or a tender salad mix, I know of no one who's had the brave and bold ingenuity to wedge finely-shaved ice into a cone-shaped cup, and to mix home-grown fruit and organic sugar into a delectable syrup, and then (so brave! so bold!) to pour that syrup on top of that ice. So there you have it, no vegetables this year, but come see me and my boys at market today (and most, but maybe not all, Tuesdays this season), where we will spin you the most delicious, most fruity, most real shaved ice available anywhere. Hope I see you later today! FYI, I'll be sending updates from time-to-time, telling about the goings-on over here at Town Farm, and certainly I'll remind you about our stupendous strawberries -- which we will be selling at Tuesday Market in June -- but I won't be sending a newsletter every week this year. If you want to receive the Tuesday Market newsletter, or even get text message reminders about market, you can sign up here.